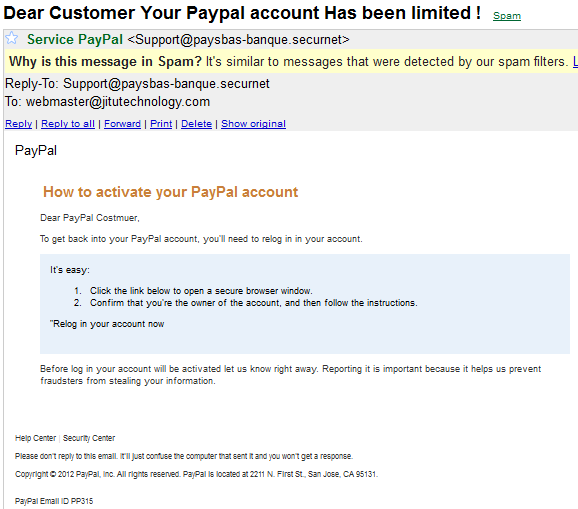 I just got a message saying “Dear Customer Your PayPal account Has been limited !”. I was afraid that my PayPal account got limited because i am using PayPal account of USA and i am accessing it from Nepal. So for a moment i thought that my PayPal account might be limited because i am using my PayPal account from Nepal. And then i logged in to my PayPal account but i didn’t find any limitation. And then i checked my email again and i found the message i got in my mail was sent from a unknown email and actually it was from a hacker. The email which i got was redirecting me to the log in page where we have enter username and password and hence that log in page was sending the email and password to the Hackers email or somewhere else. [showmyads]So what i want to inform you that, Don’t ever click on the link which you get in email. It might be phishing link. Especially, you should check sender email twice before clicking on the link you get in email. If you are getting message from your bank account or any other financial stuff then you must be very careful before accessing the link. And whenever you get a phishing email then you must inform the company for which you got an email. And what i want to suggest is” Don’t ever click on log in link you get in email” . Open the website you are supposed to log in and then only sign in to that account.